Take control of Vox with our exclusive Modern Forms app—features like Adaptive Learning make life easier every day by suggesting optimized schedules. Choose a housing with matching blades in bronze, matte white or titanium silver. A testament to the brand, Modern Forms Fans are all beautifully engineered, using only DC motors powered by WAC LED and controls technology, and of course priced to sell with all the features customers crave. The Modern Forms smart ceiling fans, most of which integrate LED luminaires, will feature a complete array of upscale interior/exterior styles and utilize smart “Adaptive Learning Technology” exclusively developed by WAC Lighting. 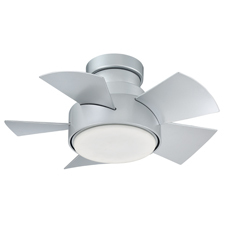 Engineered to the finest detail for unsurpassed performance and design sophistication, Modern Forms is a future-forward manufacturer and innovative brand of unique upscale all-LED luminaires, and a groundbreaking new line of smart interior and exterior ceiling fans. Originally a subsidiary of the WAC Lighting Company group of brands, Modern Forms took North America by storm in the last five years with avant-garde designs that leverage advanced LED technology developed exclusively by WAC engineering. Now it is the leading independent provider of technology and modern design in lighting and fans.